Most people with epilepsy are otherwise healthy; as long as it is controlled like most other diseases. A seizure is a physical manifestation of paroxysmal and abnormal electrical firing of neurons in the brain. Think of it as numerous voltage (hyperexcitability of neurons) going throughout the brain meaning brain waves going in all directions with the brain saying its too much activity causing the brain to go into a seizure. When the seizure occurs there is a decrease in oxygen since the brain isn’t capable to send messages during the seizure. If the seizure continues to repeat one right after another the person is in status epilepticus and if the seizures doesn’t stop the person can lead to a neuronal death; like John Travolta’s son who died of this. 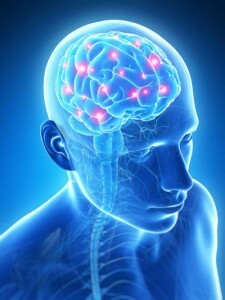 The term seizure disorder may refer to any number of conditions that result in such a paroxysmal electrical discharge. These conditons could be metabolic or structural in nature. 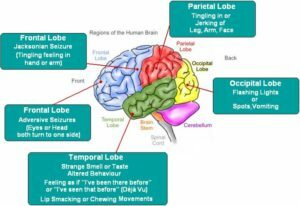 Epilepsy is the term for those who have a second seizure that occurs spontaneously and without preceding metabolic or structural cause for the occurrence. 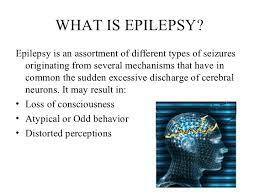 Epilepsy is a chronic disorder that requires antiepileptic drug therapy; usually thorough out life. Etiology of Epilepsy is generally a sign of underlying pathology involving the brain. It may be the first sign of nervous system disease (ex. Brain tumor), or it may be a sign of a systemic or metabolic derangement. a.) Electrolyte Imbalance=Acidosis, heavy metal poisoning, Hypocalcemia, Hypocapnea, Hypoglycemia, Hypoxia, Sodium-Potassium imbalance, Systemic diseases (liver, renal failure, etc…) Toxemia of pregnancy, and water intoxication. b.) Infections like meningitis, encephalitis, brain abcess. c.) Withdrawal of sedative-hypnotic drugs=Alcohol, Antiepileptic drugs, Barbiturates, Benzodiazepines. d.) Iatrogenic drug overdose=Theopylline, Penicillin. Other causes of epilepsy can be Trauma, Heredity. Head trauma/Degenerative Disease like Alzheimer’s or Creutfeldz-Jacob or Huntington’s Chorea or Multiple Sclerosis or Pick’s Disease. There is also tumors or genetic disease or Stroke or Infections or Febrile seizures. 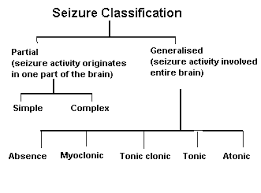 1-simple partial seizures-(the person is conscious and not impaired). With motor symptoms, autonomic symptoms and even psychic symptoms. II-Generalized seizures-(bilaterally symmetrical and without local onset).